A year back in India, nothing was better than sitting in cozy corner of my room next to window while raining outside! A cuppa kavah or ginger tea with a plate of hot pakodas!!! All above specified fritters fall in major 2 categories... Either they can be batter-dipped or spoon-fried! 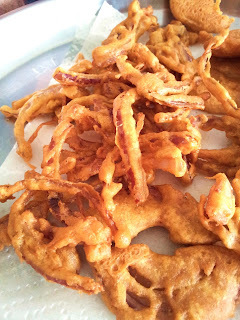 I usually add a pinch of bicarbonate soda in the batter to make my fritters fluffy! 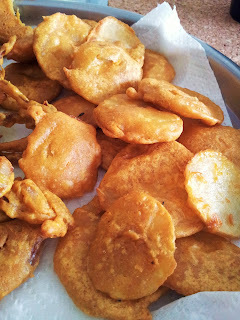 I can't actually define the taste of any sort of fritters.. but to tag a few words, I would say "Crunchy outside", "Melting inside", "Fluffy", "Spicy"!!! Now lemme come to the point... I know each one of you must have a special memory linked to this season... Share it with SJ's Food Court just now!! !